Just a quick review of BSN’s new Hyper FX. I went to pick up a pre-workout drink today and to my surprise I saw a new product from BSN. I asked the guy at the supplement booth what people had been saying about it and apparently everyone likes it better than NO-Xplode. It is comes in a smaller bottle, just like USPLab’s Jack3d and is a little cheaper in price, so I bought it. Right when I took it I got the same buzz as if I had taken Jack3d. It was a little easier to put down than a full serving of NO-Xplode too. I think this is BSN’s attempt to compete with USPLabs, because Hyper FX and Jack3d are almost identical as far as I can tell. I got the same tingling sensation as if I had taken Jack3d so it obviously has Beta-Alanine in it. If you look at the label of most pre-workout drinks you will find the mix of ingredients almost the same. This entry was posted in Bodybuilding, Hyper FX, NO Xplode, Supplement Review, USPLabs Jack3d and tagged pre-workout by Russell Jensen. Bookmark the permalink. I picked up some Hyper-FX the other day based on this review. It was the only review that said Hyper-FX was nearly identical in effect to Jack3D, and I read somewhere where there’s something in the BSN product that helps with weight loss as well, so between effective energy and help with weight loss it was worth the $29 GNC had it on sale for to give it a try. I’ve used it three times now, and I like it a lot. I’ve finally been able to keep right up with the insanity workouts and feel great doing it. One thing I wanted to point out however is that the warm tingly feeling experienced when taking Hyper-FX does not “obviously” indicate the presence of Beta-Alanine. It is the same sensation as a “Niacin Flush” which is caused by products with Niacin which dilate the capilaries and cause a sensation similar to a sunburn to some degree, depending on how much is taken. 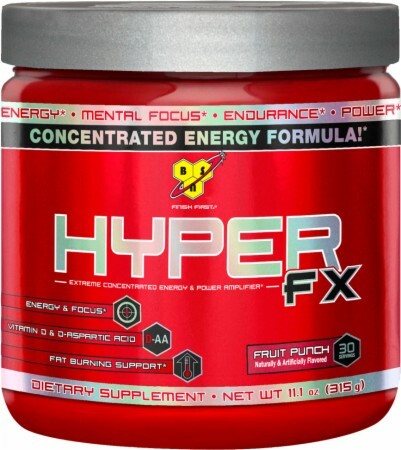 While Hyper-FX does contain an undisclosed amount of beta-alanine in its “proprietary blend”, it also contains 20 mg of NICOTINIC ACID, which is a form of Niacin. A known side effect of the nicotinic acid form of Niacin specifically is vasodilation of the capillaries, known as “flushing”. (just do a search on “nicotinic acid flushing” to verify, if you’d like). Capillary dilation is desirous as it allows nutrients to be delivered to the cells faster, and is the same benefit provided by N.O. products without the flushing side effect. So, don’t assume anything and read the label to see what ingredients a product has. Personally, I haven’t notice a flush from beta-alanine with any product I’ve taken so far, but I’ve experienced a niacin flush many times over the years, and when I’ve felt the tingling sensation have always found some form of Niacin has always listed amongst the various ingredients. Thank you for the insight/clarification on the beta-alanine and nicotinic acid.